Normally I work in business class, which is the most junior position on the airplane due to the amount of work involved, but that’s okay because I like to work in business class. I even like business class passengers. I do! And because I work so often with people who fly in business class on business, I can spot a digital nomad a mile away. Last month when I found myself working in coach on a flight from Los Angeles to New York, a passenger rang her call light and wanted me to ask another passenger sitting a few rows ahead in a seat that had a power port if he’d be willing to switch seats. Right away I knew the answer would be no – just by looking at him. What can I say? I’m a flight attendant. I know people. “Can you ask him anyway?” the woman pleaded, eyeing the man who looked to be in his early fifties. “Sure,” I said, knowing full well the man would not move, not when he looked like the type of passenger who uses Seatguru.com to pick a seat, that seat, several months in advance. Now I can’t tell you exactly what it was about him that screamed digital nomad, but maybe it had something to do with the fitted black sweater that had been paired with the dark blue jeans and leather loafers. Or maybe it was the leather carry on bag, a Tumi I bet, which had already been placed underneath the seat in front of him. Whatever it was he had that vibe, the-I’m-connected-vibe, and it was swirling around him as I approached his seat, the one located on the aisle, right next to the business class galley. You know the one. 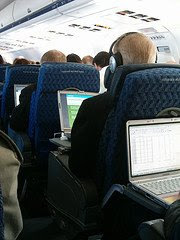 “Sir, are you traveling with a laptop?” I asked, smiling politely. What’s your favorite position? The less one? I really like your blog. Well done.